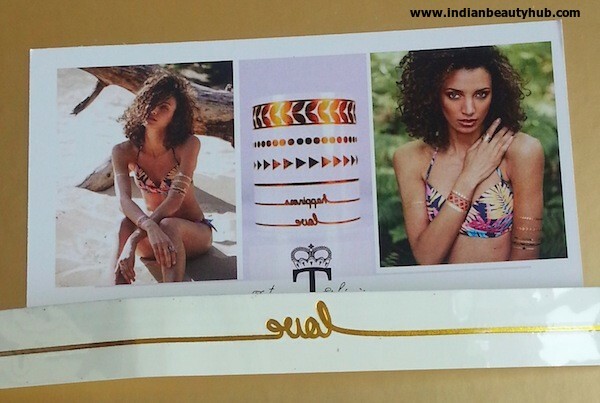 Hello everyone, I received Anniversary Edition of My Envy Box curated by Vogue India 2 days back. 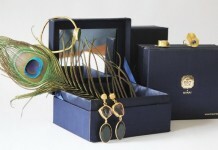 This month all the products samples came in a luxurious golden box with red ‘My Envy Box’ logo on the flap. This month I received total of 5 product samples from luxurious brands like Estee Lauder, Sebasitan Professionals, H2O+, Innisfree and Skin Yoga. 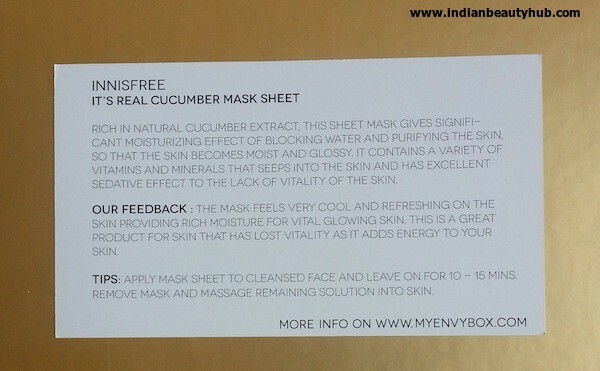 Innisfree It’s Real Cucumber Mask Sheet : I got a 20ml sheet mask with cucumber and green complex. It is enriched with Vitamins & minerals and is highly moisturizing. This is my first sheet mask from the brand and I am looking forward to use it soon. 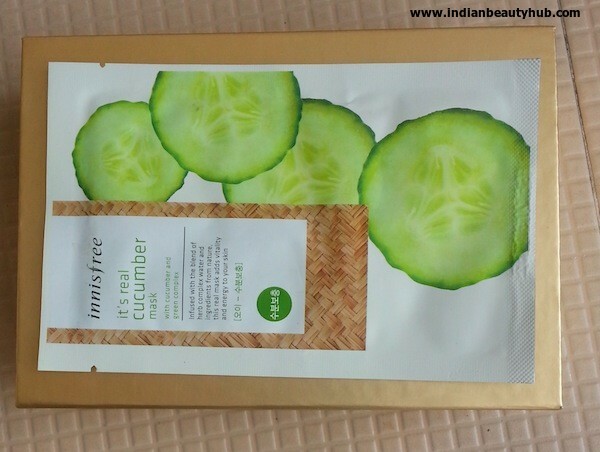 Innisfree It’s Real Cucumber Mask Sheet Price in India : Rs.100 for 20ml. Click to read full review. H2O+ Sea Salt Hydrating Body butter : Next I got a 30ml sample of this super-intensive moisture cream. I really like H2O+ Spa range and am quite excited to use it. It is a thick white cream which smells like the body lotion from the SPA range. This sample is good enough for 4-5 usages. 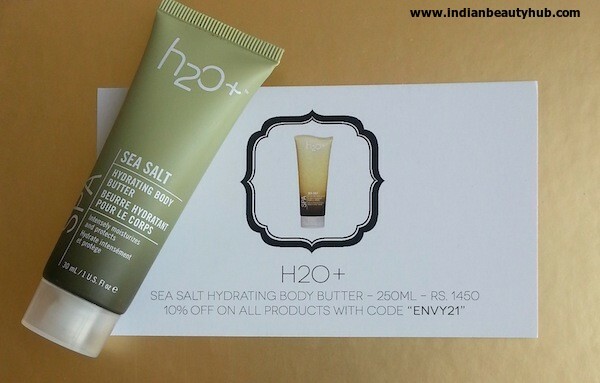 H2O+ Sea Salt Hydrating Body butter Price in India : Rs.1450 for 250ml. Click to read full review. 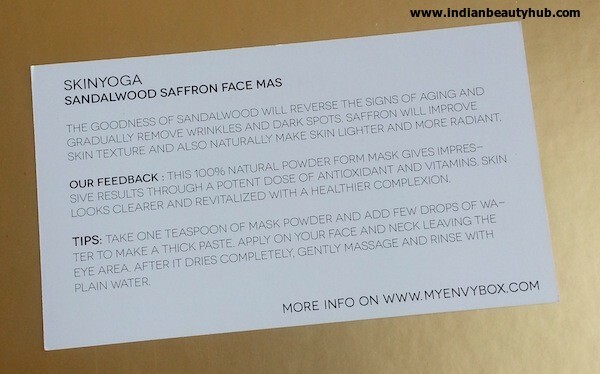 SkinYoga Sandalwood Saffron Face Mask : They sent a 6g sample of this 100% natural powder face pack. I have used a few SkinYoga products and really liked them. It claims to reverse signs of aging and removes wrinkles & dark spots. This samples is good enough for 2-3 usages. 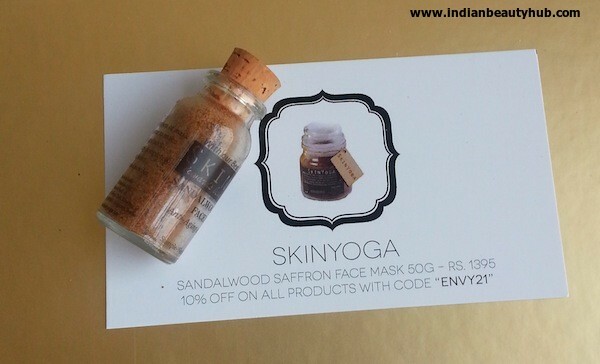 SkinYoga Sandalwood Saffron Face Mask Price in India : Rs.1395 for 50g. 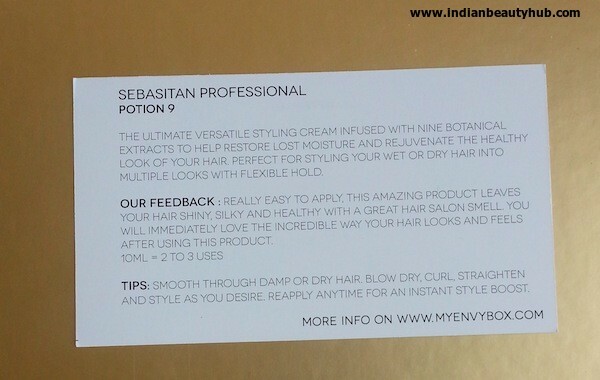 Sebasitan Professional Potion 9 : This styling cream is enriched with 9 botanical extracts and it helps to restore moisture of the hair. It can be applied on wet or dry hair before styling. This 10ml samples will last for 2-3 usages. 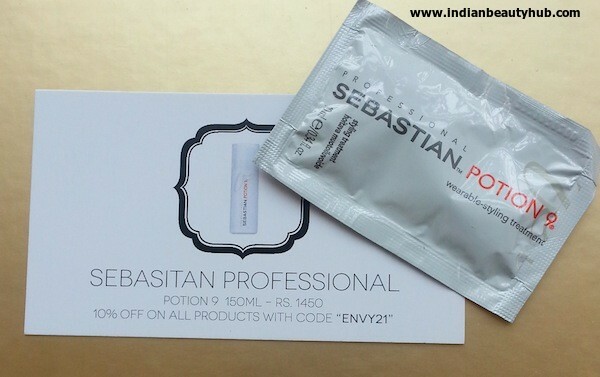 Sebasitan Professional Potion 9 Price in India : Rs.1450 for 150ml. 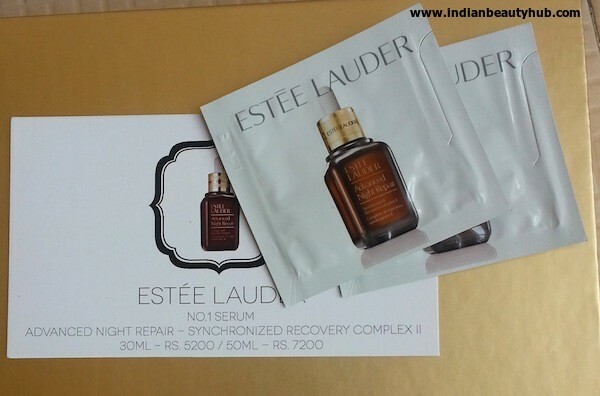 Estee Lauder Advanced Night Repair Synchronized Recovery Complex II : I got two samples (1.5ml each) of this night serum. It comes with Chronolux CB Technology that helps to reduce signs of aging. It claims to purify & hydrate skin and makes skin healthy & glowing. 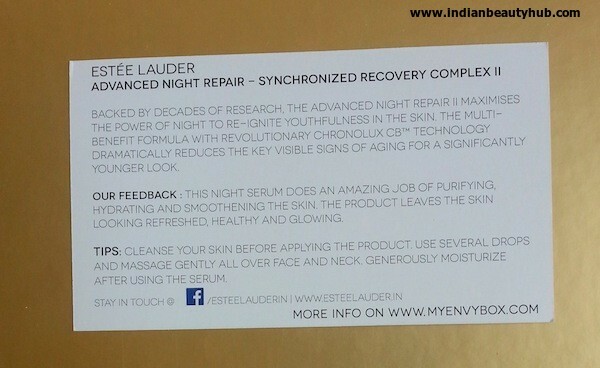 Estee Lauder Advanced Night Repair Synchronized Recovery Complex II Price in India : Rs.5200 for 30ml & Rs.7200 for 50ml. 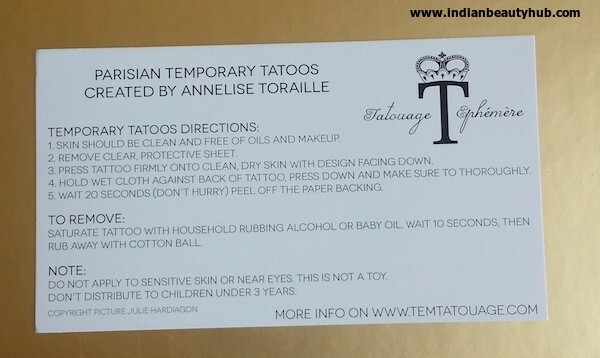 I also received a beautiful golden Parisian Temporary Tatoo created by Annelise Toraille. 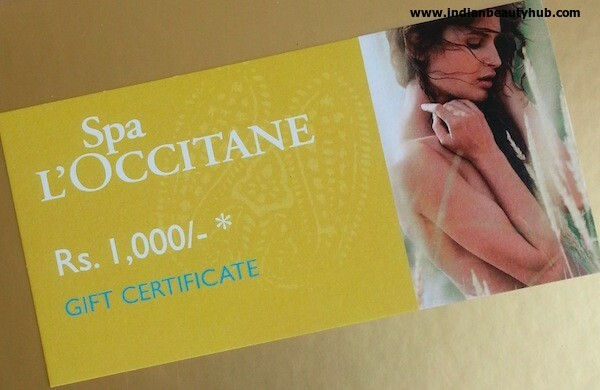 They also sent a L’occitane Spa voucher worth Rs.1000 which can be used at all L’occitane Spas in India. 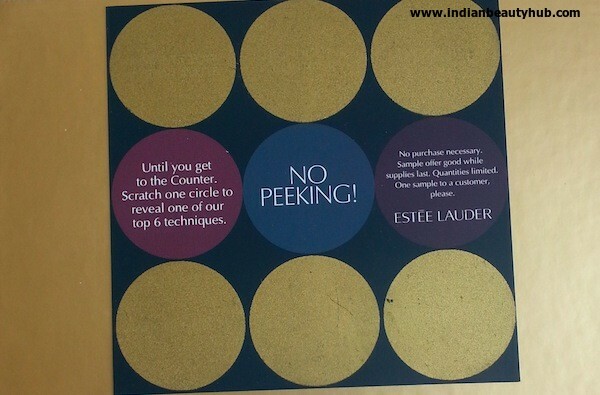 Next I received a 3 minute beauty scratch card from Estee Lauder. You need to take this card to Estee lauder counters and you can learn one or more of top 6 beauty secrets along with complimentary beauty samples. 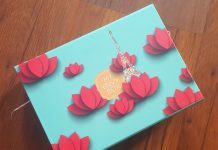 Overall I liked this month's luxurious golden box and the products samples came inside it. 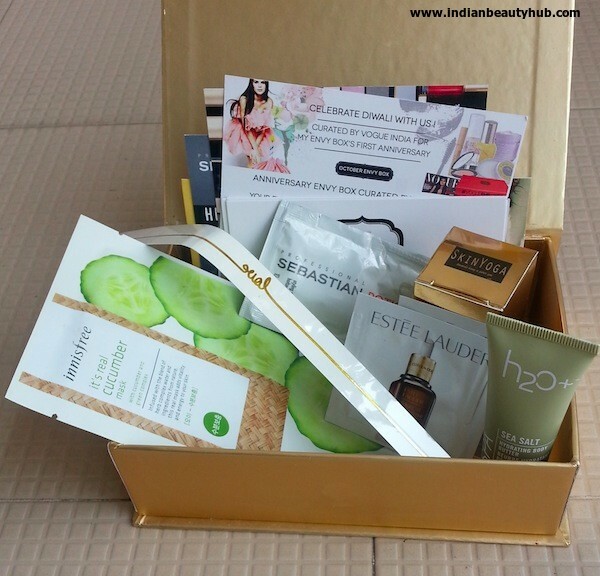 I like Innisfree sheet mask, Estee Lauder serum & H2O+ body butter from October Envy box. I wish they had sent some makeup samples too.